and also a select few of the box profile sheets. We keep a PVC range in both the Big Six and Standard 3. Foregale specialises in the supply of glass reinforced plastic (GRP) sheets. In our GRP (fibreglass) range, we stock roof lights to suit the Big Six profile and also a select few of the box profile sheets. Weights and grades vary for each product – please get in touch with our sales team for further information and pricing. We have an extensive range of GRP sheets available for sidelights and roofs. If you have a specific profile in mind that you don’t find listed on our website, get in touch with us today as we are able to order them in as specials for our customers. GRP was actually developed during World War II in order for it to be used in airplanes – and its major benefit is that it is able to be moulded into almost any shape imaginable, highlighting the benefits of using fibreglass as both a safe and durable alternative to metal, stone and brick. 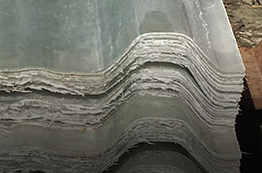 You’ll find the sheets you need to match any corrugation right here with Foregale, with our products boasting the highest levels of both accuracy and safety, taking into account U values and fire ratings. You’ll find our single, double and triple skin roof lights can be used for a wide range of construction projects, be it a warehouse or factory, or even a retail facility. The roof lights and sheets you’ll find at Foregale offer high impact resistance so there’s far less chance of them breaking than other products on the market. You’ll be able to take advantage of unrivalled flexibility and light stability, with the products also well protected against discolouration and moss and lichen growth – which is exactly what you need.